On today’s agenda? The casual Thanksgiving stylings, as promised yesterday two days ago! Yes, I meant to post these yesterday, but I had a few finishing touches to do and then my half day of travel to get to family turned into more of a full day (no complaining though!! ), and then once I got to my family…you know…everything else just kind of goes out the window! So, Happy Thanksgiving, and enjoy these casual looks! 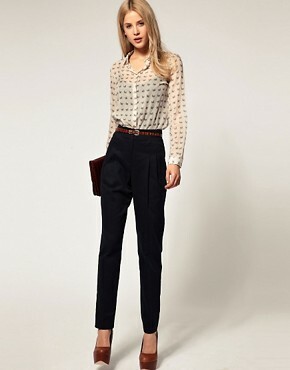 I love pairing this sheer black blouse with the navy high-waisted trousers…the combination of black and navy is divine! some sophisticated, chic flats and a beautiful necklace complete the look! This sweet as can be retro top is roughed up a bit with these awesome pants with leather-trimmed pockets and the stone cut ring. The bit of shine in the collar of the top is further emphasized with the flats (and ring). Beautiful! Which look is your favorite? Happy Thanksgiving! P.S. Last year’s Thanksgiving looks. There is a very bohemian feel to this top with its embroidery, lace, and overall silhouette. Kristie wants the top to look “fresh,” so I’m thinking adding some modernity to it will be key in achieving this. Let’s dive right into some stylings, shall we? With summer heat, shorts are a great way to go with this top. The key is making sure the proportions work – the shorts must be longer than the top…must!…so super short short shorts won’t work! In terms of style, something clean cut, without much embellishment is ideal. This way, the intricacy of the top stands out without competition. This most definitely will provide a clean, fresh look. Keep in mind with these stylings using shorts that I’m assuming the proportions work…these actual shorts may or may not work, depending on the individual. Crisp white is a great color to wear with the top – instantly, the top feels all the more fresh and all the more modern. At the same time though, the white will still act as a backdrop to highlight the lovely blouse. If you want to take the top in a more committed Bohemian/almost hippie way, consider wearing jean shorts, such as these. To help keep the look feeling new, consider adding these bold pops of orange in the form of a clean-lined bangle and clean-lined clutch (why not a purse, you ask? : a clutch such as this, as opposed to a purse-purse, feels a bit more modern). And no, I don’t think the orange bangle with the clutch will seem matchy-matchy at all in this case! One of the absolute best ways to go with this top – as in, you’re pretty much guaranteed a successful look – is pairing it with skinny jeans. This is because the skinny jean is tailored and stream-lined – the tunic-type top will look great (proportions wise) and the pants won’t take away from the top’s beauty. Any color could work nicely too. Using skinny jeans in a fun, bright color, such as these pink-red ones, is a great way to modernize the top. The shoes and necklace are great – they are simple enough to complement the other pieces, but also add a great deal of modernity to the look, while still being classic. If the colored denim wasn’t quite your thing in the last look, this is a great alternative – the exact same look, but with crisp white jeans instead. This is a chic and polished look, for sure! This is a classic look with a hint of vintage feeling too, while still appearing very current. With only four pieces, you might feel the need to add more to it, but I think it’s great just as is – this top really doesn’t need a whole lot to make it feel complete. Wear this cardigan over the top, and then belt around both to get a defined waist. The simple skinny jeans, bracelet, and shoes complete the look! Don’t you love the pretty pink colors with the blue-green of the shirt?! This is a unique look considering the fact that it has both a funky, yet equally chic, feel to it. This funky feel is in large due to the distressed, rolled hem crops and the loafers. The chic feel is in large part due to the sophisticated blue-gray-green color scheme and the sublime bag. I’m going to go ahead now and take the time to caution you about wearing wide-leg pants with the top – while it can absolutely look lovely and very 7os inspired, it can also just look plain bad. The key in pulling the look off is wearing high heels to really, really lengthen your legs. The shoes should ideally also be pretty simple in shape. This is a gorgeous combination of pinks, blues, and purples, if I do say so myself! Anyways, this is a great styling because it can be worn TWO ways. First, you could tuck in the top to the skirt, and then belt over the skirt (close to the natural waist). Or, you could leave the top tucked out and belt around the blouse around the natural waist. Either way, this is a gorgeous look! Another styling idea would be to wear the top over a dress, belting around the waist. Other great ideas include playing with cardigans, jackets, and belts. This could be fun – leave the it unbuttoned and then belt around the waist. The polka dots will play nicely with the pattern of the top! This would work with the top and a skirt, pants, or shorts! So versatile! You could even belt the top underneath the jacket! Before officially wrapping up, let’s talk a bit more about color regarding the blouse. With this blue-green color, so many colors are going to work – blues, greens, purples, pinks, oranges, neutrals (grays, blacks, browns, khakis, whites, etc). The key is to not use too many dark, washed-out colors with it though, because it can start to look drab. If, by chance, you own this top in its more pinky-coral color…. ….I would still suggest blues (most shades), as well as many of the other colors mentioned above. You may want to avoid some of the darker colors, as well as some pastels, although you can still give them a try. Navy, used as a neutral, would be gorgeous, as would a light-medium-dark gray. And now, my dear readers, we’re done. Hopefully Kristie has gotten some useful ideas. I wish you all the best of luck, Kristie! As always, feel free to send your own styling requests to me at theanthropologieconnoisseur@gmail.com! Thanks! Vintage Sail – Styling Request! I’ve got some exciting news…today I have a styling request! Shermineh also is concerned with making the skirt work for some chilly spring weather, but as the weather changes to hot summer heat as well. She’s tall, skinny, and up for anything. Naturally, I’m quite excited for the task. My main advice for this skirt is that, for the most part, you want to pair more modern pieces with it to keep it from looking too vintage-y. At the same time though, you don’t want to lose its vintage appeal either, so it’s a balancing act. I’ll deliver some more tips as I go through some styling ideas. Ready? Loosely tuck this subtely patterned top into the skirt. This way, the button detailing of the skirt is still clearly visible, and the waist is also defined. Pair with this these modern yet still slightly throwback-esque pair of shoes, as well as the not-quite-statement-size necklace. The complete look is soft and feminine, and very elegant – not in a stuffy kind of way though. While this is a similar base as the last outfit, we’re going to do something different: this time, don’t tuck in the shirt. Instead, let the shirt hang over the skirt and belt around the top just below the natural waist. As is, this look is perfect for warmer months (you could always go for a more sandal-type shoe if you’d prefer, too). This truly transforms the look to cooler-temperature-appropriate. You could certainly keep the belt around the top, but you could alternatively instead replace the jacket’s belt with the belt I have pictured. Leave the jacket open – not closed – and you’ve got yourself one beautiful look! And, of course, you could always ditch the tights if it’s not quite that cold! Now this is a pretty vintage-committed way to go with the skirt, but it’s still pretty modern. The shirt could easily look too nautical, but by pairing it with the right accessories, it works. The necklace adds a nice statement, while the shoes really help tie together the top and skirt. If you own this look, surely you’ll receive tons of compliments! This is definitely a more toned down version of the previous look – there’s nothing wrong with going this route as opposed to the other! Again, by pairing modern shoes and a delicate necklace with the top and skirt, you’re helping to modernize the latter two items. The complete look is very polished. Throwing on a tote bag and then swapping out for a clutch would easily transform this to a work-to-errands-to-dinner kind of look! This is a riskier look to pull off – the almost denim-on-denim appearance, but if done well, it looks good. I’ll be 100% honest though and admit this isn’t my ideal choice of a denim top for the skirt just because the buttons of the top and skirt are almost a bit too similar, and perhaps a slightly lighter shade would be better. It still works though, but just use your imagination a bit! 🙂 The key to the denim-on-denim with this skirt is pairing more modern accessories with it – again, ideally the necklace would be either a bold color or a very modern/chunky shape. In this look, I love the brightness of the necklace and clutch. The shoes add some clean lines that really pull the look together. This could easily transform for cooler weather as well – throw on a wrap sweater and/or tights and you’re good to go! NOTE: From here throughout the rest of the post, WordPress stopped letting me link to Anthro’s product page! 😦 That means you’ll unfortunately have to search for any of the items you like. Sorry for the inconvenience! This is probably one of the most committed vintage ways to go with the look. The real key to pulling it off is a good amount of both confidence and some attitude (play with different hairstyles to help with the latter). Gorgeous though if pulled off, no? Any of the above would look great tucked in, with necklaces, perhaps. There are many, many colors I think could work with the skirt. White, red, yellow, blue (even denim), etc. Accents of green work well too. To add some interest, the power of adding a necklace should not be underestimated! Even if you wear a simple solid colored tank, adding a necklace will take the look to a whole new level. Balance the vintage feel of the skirt with some modern aspects. There you have it! I hope Shermineh has some great ideas for wearing her beautiful skirt! Do you have a styling request?! Email me at theanthropologieconnoisseur@gmail.com! Thanks! (To read more about styling requests, click the link at the top of the page that says “Styling – What Do You Want Styled?”)!